When I started work in the Broadcast television industry in 1975, video was analogue (with only 3 of 4 formats to worry about, audio was ‘just audio’ and networking was a black art practiced by an ‘elite group’ of IT wizards. I was lucky enough to join a small company that had developed the first video rate analogue to digital convertor. That company grew to become Quantel, who were at the forefront of the digital television age. Analogue television transitioned to SD digital video, and now digital video over SDI offered the opportunity to combine all of the elements (audio, video, control and metadata) over a single wire. Surely this would solve all of the industry’s problems? Networking was still just a black art. Interestingly today, a large proportion of the world’s television viewers still watch ‘analogue’ television. Then came the advance of HD video and this just seemed to fit into the existing infrastructure and only added a few more formats to worry about. Advances in network speeds and topologies started drawing the attention of some in broadcast who saw an opportunity to directly link together broadcast programme content creation with delivery via terrestrial and the internet. After much discussion, experimentation, trial implementations and recognition by standards bodies and industry syndicates alike, SMPTE 2110 was born. This now advocates separating the video, audio and ancillary elemental (control and metadata) streams thus returning the industry back to the days before SDI. These days anyone wanting to implement an IP solution has either got to be one of the ‘IT Wizards’ or become one very quickly. Oh, and by the way, the number of potential video formats, link types, colour spaces, dynamic ranges, etc is now eye watering. What is needed just to keep track of the content streams (video, audio, control and metadata) is a piece of Test & Measurement equipment that can let you ensure that the content streams are correct, regardless of how and where they were created, what format, frame rate, colour space, dynamic range or how they actually got to you for checking. After its highly successful launch at NAB 2017, the Ultra TQ has become a network connected Broadcast Waveform Rasteriser supporting both SDI up to 3G and SMPTE 2110 / 2022-6 IP connections. This configuration has become popular with many broadcasters as it provides the flexibility and future proofing that is essential in changing technological times. For NAB 2018 the Ultra TQ now gains the ability to analyse and decode Dolby E and D audio for monitoring and quality checking, the ability to de-embed SDI / 2110 / 2022-6 audio content to AES/EBU Audio outputs as well as the ability to monitor AES/EBU Audio on discrete audio connections. There is also and analogue monitoring output, for those who actually want to hear the audio quality. The IP connectivity and the new audio functionality will also be available on the Ultra XR as an upgrade for existing customers. 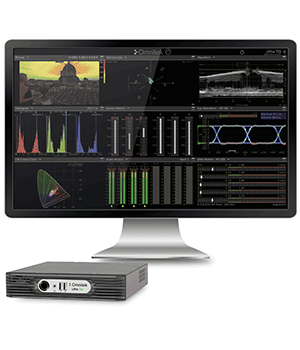 Ultra TQ’s analyser instruments include picture, waveform monitor, vectorscope, gamut meters, full audio monitoring and loudness measurement, video timing, video / audio status monitoring, event logging and closed caption logging as standard. These can monitor either SDI or SMPTE 2110/2022-6 SFP inputs. This makes the Ultra TQ ideal for a mixed SDI / IP environment and ‘muggles’ (non IT Wizards) like me. The Ultra platform has been designed to be robust and reliable and comes with a year’s factory warranty as standard. This warranty can be extended, at nominal outlay to minimize the cost of ownership when maintenance budgets are tight. Come and see Ultra TQ and other Ultra Family members at NAB 2018 (Central Hall, Booth C7412).